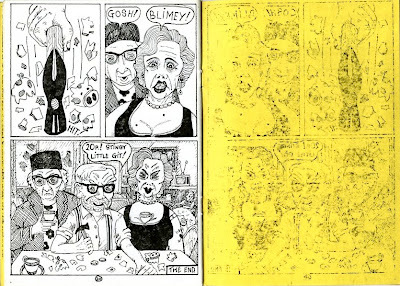 I reckon it's about time for another entry in my – now apparently monthly – mini-comix archaeology series Notes from the Small Press; links to previous Notes at the end of this post. 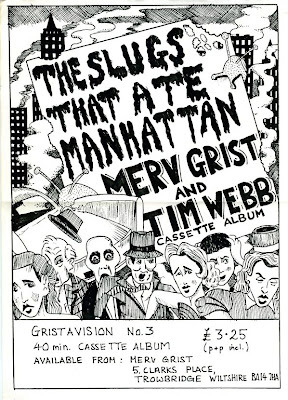 And today I have for you, o discerning reader, a selection of comics by Mr. Merv Grist. Grist's comics share a sensibility with fellow small-presser John Bagnall's, namely a preoccupation with the idiosyncrasies of British working class life and the paraphernalia and detritus of postwar suburban England. 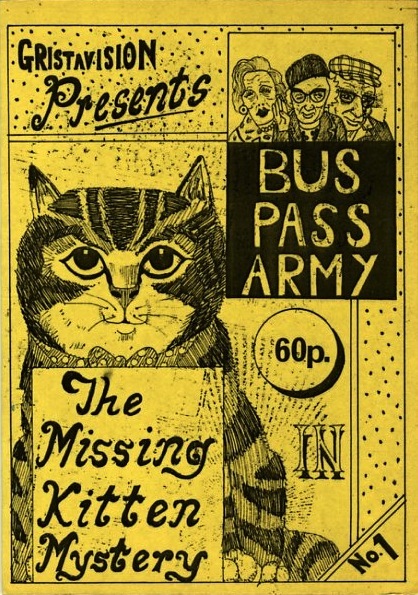 Both of the Gristavision titles I own hail from 1986; Buss Pass Army details the efforts of a group of pensioners as they look for a little boy's missing kitten, and features irate shopkeepers, angry punks and a surplus-to-requirements page showing the items purchased by Mrs. Gerrish on a shopping trip (including a Status Quo LP), while Beach Bop Barnardos is about a seaside charity concert starring obscure toothsome pop pianist Russ Conway. 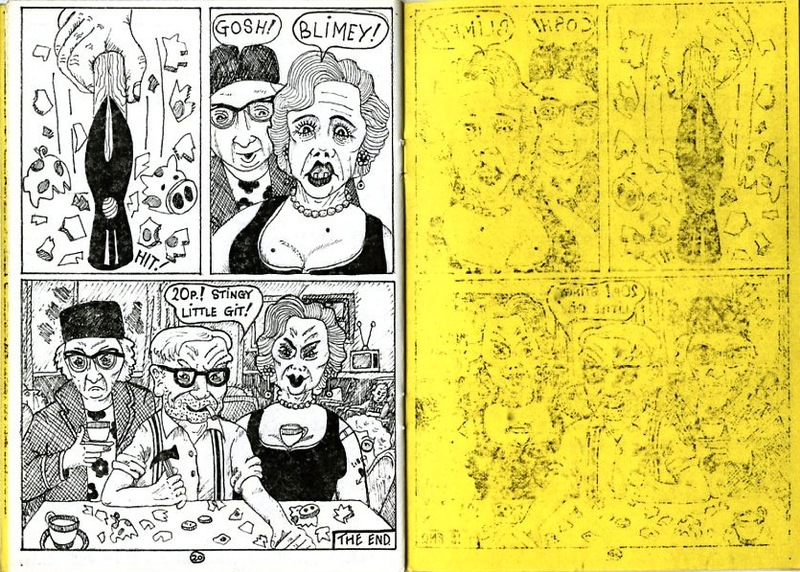 Both comics are as bizarre and entertaining as that would suggest. The stories are characterized by a crunchy slapstick humour and a willingness to deflate the preceding events with a puncturing punchline. 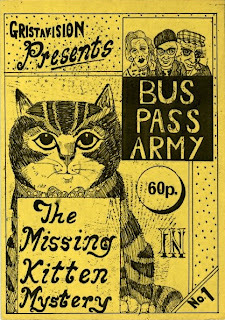 Bus Pass Army ends with the senior citizens recovering the cat from a local canal only to discover that it is, of course, dead; after suggesting using the corpse as fertilizer for the garden, the deceased moggy is returned to the little boy's mum, who proclaims it "the loveliest kitten I've ever seen". "But mum it's dead," replies the distraught lad, only to be told, "Never mind, remember it's the thought that counts." 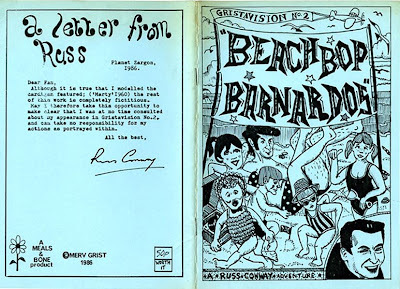 Beach Bop Barnardos, meanwhile, closes with Russ Conway being bricked off stage before flying into the sky on his rocket-powered piano, heading "back to his own planet". Whoops. Nerdy collector that I am, I keep some of my other comics in comic bags to protect them from wear and tear. 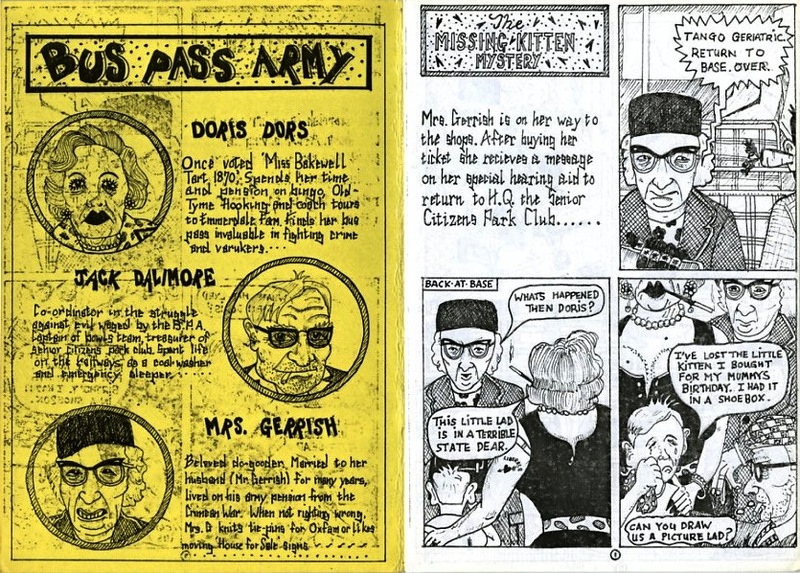 But in the case of Bus Pass Army, the mucky pup, I actually keep it bagged in order to protect my other comics from it. 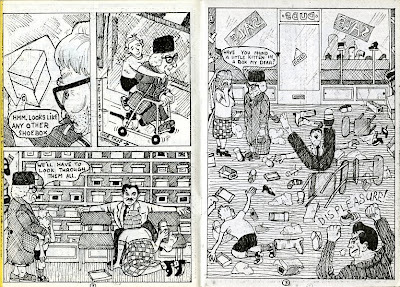 Grist's artwork in these comics is a beguiling mixture of the awkward and the expressive: clearly influenced by British kids' humour weeklies like The Beano and The Dandy, he was also evidently tapping into a modern art sensibility of distortion and exaggeration; there's a striking resemblance in the drawing to artists as diverse as George Grosz, Max Beckmann and, more contemporaneously, Scottish figurative painters like Steven Campbell and Jock McFadyen. That fine art aesthetic further manifests itself in the two stories Grist contributed to Fast Fiction. 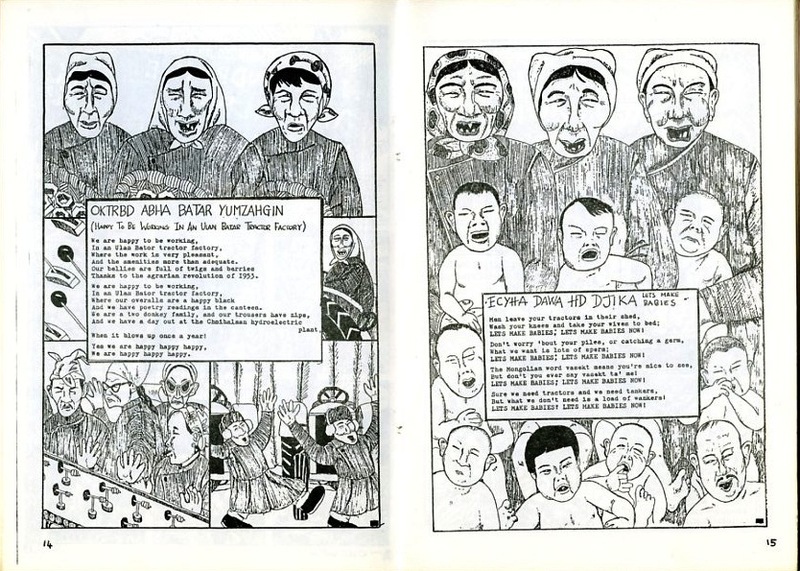 Both "Botts Common" in Fast Fiction #24 (1987) and "Great Moments in the Mongolian Film Musical" from Fast Fiction #27 (1989) make use of unusual page layouts, with text and pictures arranged more as tableau than as comics. Of course, those stylistic choices aren't quite so surprising when you take into account that Grist is a painter himself. As Mervyn Grist, he paints figurative and landscape pictures which owe a little to idiosyncratic English artists such as Stanley Spencer and Carel Weight, and is represented by the John Noott Galleries dotted across the Cotswolds, as well as having pieces in the Cavendish Art Library. But alongside the painting and the music and comedy, Grist also manages to fit in a day job as an Archives Conservator at the Wiltshire and Swindon History Centre. 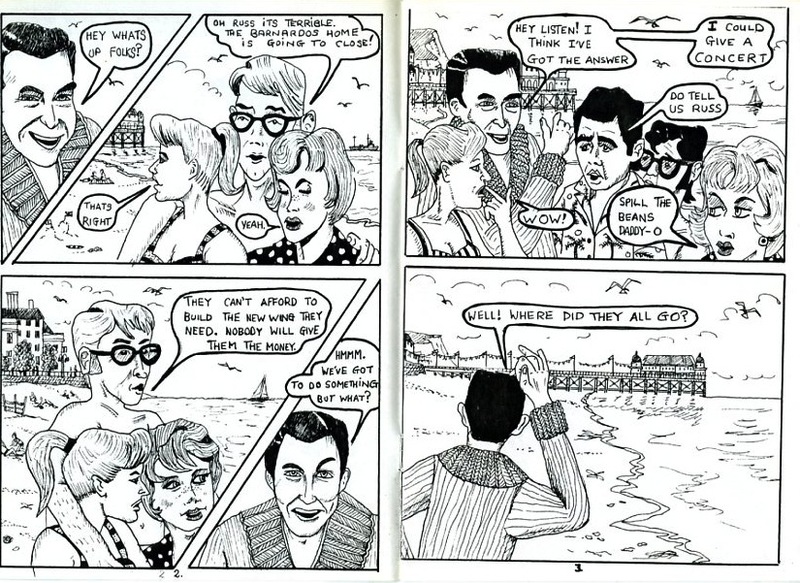 I don't know if he's still making comics on top of all that – perhaps if he chances across this post he can let us know – but his paintings in particular are well worth a gander, and amply demonstrate that his quirky outlook on British life is as uniquely compelling as it ever was. "Hi, a friend directed me to your site and can I say how much I enjoyed it. Thanks also for a nice piece about me! 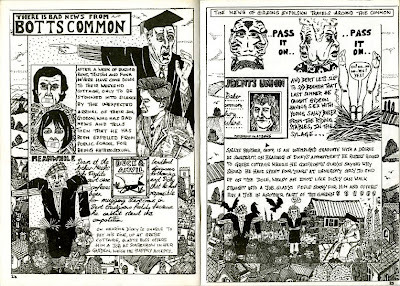 I had no interest in comics as a kid but began collecting early 20th cent. 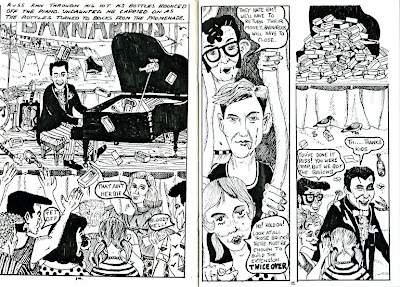 comics when I was at art college in London and you could pick them up very cheaply in the original Vintage Comic Mart (a tiny upstairs room off Shaftesbury Avenue) before it all went posters, pricey and pear-shaped in Soho. 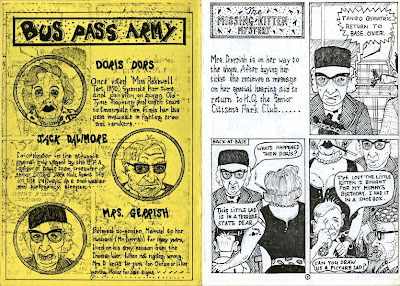 As for the Small Press, I sheltered from the rain one Saturday in a Zine Zone Comic Fayre in Bath and was inspired to have a go by all the stuff on offer and the enthusiasm of Terry Hooper and his gang. I produced about 12 titles altogether I think. 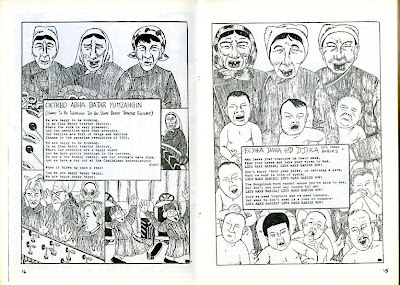 (There is a guy in Italy who is compiling a small press directory, I suspect you know of him, Casterello? something like that, who knows more about them than I do!) About 20 copies of each title had the ‘infamous’ laminated cover which at the time I thought looked impressive. My most successful title was Les Bence-Manager’s Notes which, ironically, was virtually all text. It had a football theme and got an exceptional review in the fanzine When Saturday Comes. It sold an incredible 3000 copies, was taken up by Virgin, expanded and published in paperback as Life At The Tip in 1995. 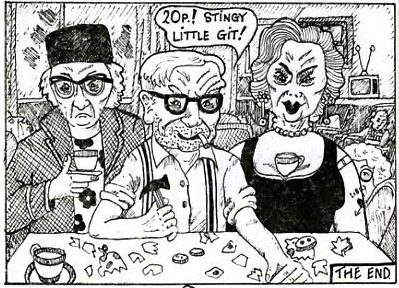 It was also serialised on the fledgling Radio 5 Live. 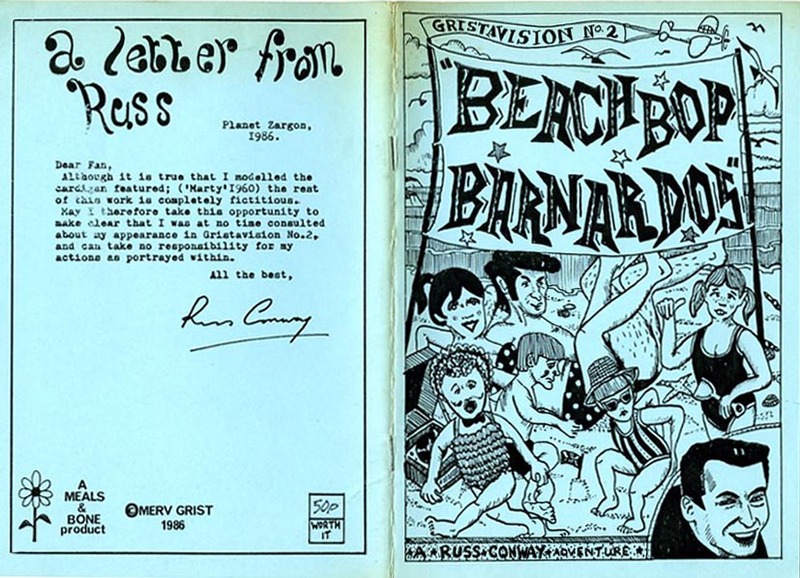 Beach Bop Banardos became a rock and roll stage musical with a number of successful performances although it failed to revive Russ Conway's career. I have devoted most of my time since to painting and performing. None of the my paintings I have discovered on the web by the way are under 25 years old! More recent work, which I'm happy to say never gets as far as galleries, thanks to a healthy base of collectors, will be on the web soon. 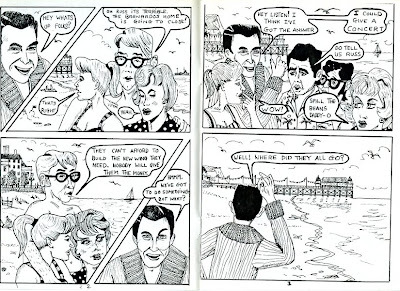 Although I didn’t continue with the Small Press format I have continued jotting down story lines and with so much interest around, I have the urge to take it up again." An excellent summary of Grist's accomplishments, particularly strong on articulating those many visual references and resonances. Well done! 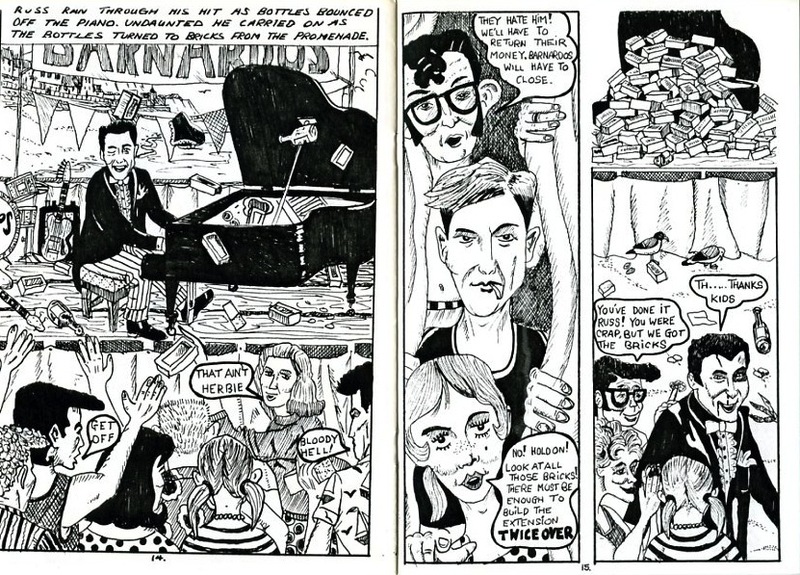 I love everything Grist ever wrote or drew, and it's a personal pleasure to see some work that's new to me, since you've got some of his comics I'm missing! Thanks Ed! 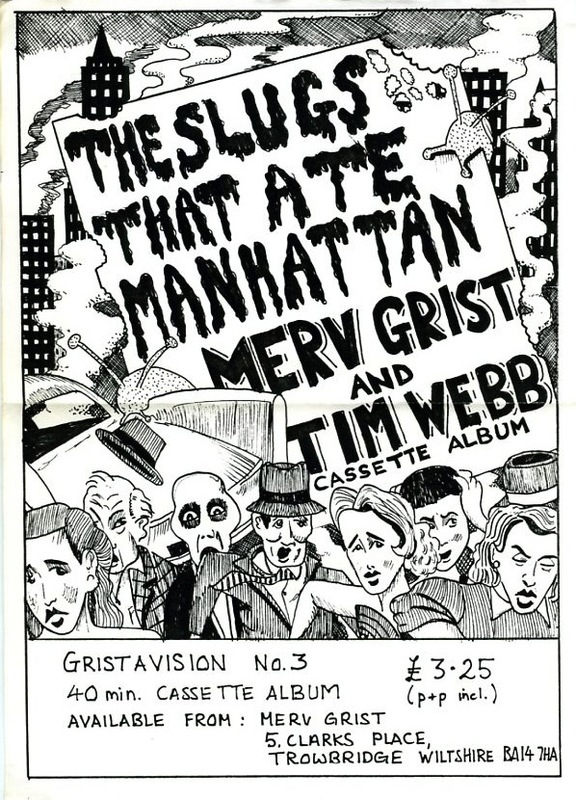 And you're more than welcome to grab those covers if you want to add them to your Merv Grist gallery.